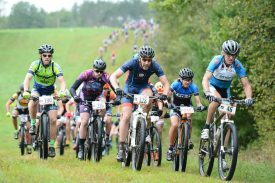 CABLE, Wisc., June 1, 2018— Limited races spots are still available for the Chequamegon 40 and Short & Fat 16 mile events for this year’s 36th annual Chequamegon Fat Tire Festival, presented by Trek and produced by Life TimeSM, the nation’s only Healthy Way of Life brand, set for the weekend of Sept. 15, 2018. Both events are part of one of the longest running and largest off road events in the nation. Race spots for the weekend’s main cross-country events are limited to a total of 3,100 riders—2,100 participants in the Chequamegon 40 and 1,000 in the Short & Fat 16-mile event—and the race reaches sell-out each year. Race day hopefuls can still register now at http://www.cheqfattire.com for the limited spaces still available in either distance on a first-come, first-served basis. To support local trail advocacy efforts, five dollars from each 2018 entry fee collected will be donated directly to the Chequamegon Area Mountain Bike Association, the American Birkebeiner Ski Foundation and the International Mountain Bike Association. For complete details of the registration procedure and other event information visit www.cheqfattire.com. Direct all correspondence to CFTF, PO Box 267, Cable, WI 54821, and 715-798-3594 or via email to cheqfat@lt.life. Life Time champions a healthy and happy life for its members across 129 destinations in 37 major markets in the U.S. and Canada. As the nation’s only Healthy Way of Life brand, Life Time delivers an unmatched athletic resort experience and provides a comprehensive healthy living, healthy aging and healthy entertainment experience that goes well beyond fitness to encompasses the entire spectrum of daily life for individuals, couples and families of all ages.